Business is 24/7 these days, but humans aren’t meant to handle that pace. And while you may think about your business nonstop, your employees probably don’t. If you expect them to keep up with your nonstop pace, they’ll burn out. 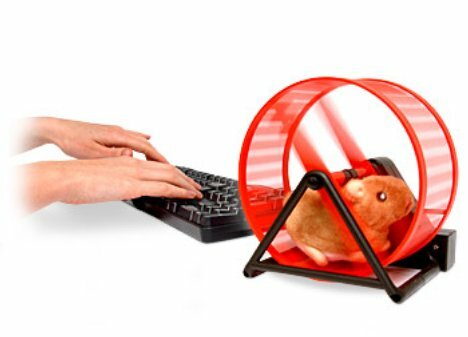 If you feel like you and your employees are just hamsters on a wheel, running faster and faster but not really getting anywhere, try these five tips for working smarter, not harder. They’ll help you and your team get your work done without losing your minds. Since you obviously don’t have Google’s endless resources, I suggest a variation on the concept: Devote 20 percent of your time to big-picture thinking, planning and strategizing for your business. While you probably can’t afford to have employees tinkering with ideas unrelated to your business, you can (and should) encourage them to think about the future, the challenges and opportunities your business might face, and how you all can take advantage of them. Twenty percent time can lead to innovations like better systems, streamlined processes, and new products or services. Make it internal. Most of us can’t ignore customer emails for a full day, so don’t even try. Focus on stopping in-house email. Make sure your business is suited to it. If most of your employees work at home or are on the road all day, they obviously need email. No-email days work best if you’re all in the same office. Encourage face-to-face interaction instead. If employees just start texting or IM-ing each other, you haven’t gained anything. Companies that have implemented no-email days report that the overall amount of email ends up being reduced even on email days because employees get used to talking to each other instead of constantly emailing. Most types of businesses can offer employees work-at-home days at least once a a week. By their nature, work-at-home days provide employees with a greater ability to focus without the distractions of coworkers, meetings or the water cooler. To keep scheduling simple, you could try having everyone work at home on the same day of the week (this also cuts back on the utility costs in your office). Even if the nature of your business prevents your employees from working at home, you should take a work-at-home day on a regular basis. By being out of the office, you’ll find you think more creatively, get more done and face fewer distractions. Provide exercise balls for employees to sit on instead of chairs or buy adjustable-height desks so employees can stand while working. You could even spring for one standing desk with a treadmill and let everyone take turns on it, since most people don’t want to stand or walk all day long. Have everyone take regular breaks to get up from their desks and stretch or move around. Encourage employees to use their lunch breaks to fit in some exercise. Even just a quick walk around the office park can be incredibly rejuvenating. It’s tough to turn off business when you’re a business owner. Even after you leave the office, it’s very likely you check your email late into the night. If there’s a truly urgent situation, it’s unavoidable, but it’s also all too easy for it to become a habit. The problem is, you and your team can never really recharge if you’re nervously checking email from 5 a.m. until midnight. Try setting time limits on business-related emails. For instance, one company restricted work email between 10 p.m. and 6 a.m. after finding that nonstop emails were stressing employees out. As the boss, you’ll undoubtedly spend longer hours than your employees do checking your email, but even you should put some restrictions on it to give yourself more downtime.